کسینی سے لی گئی مشتری کی ایک جامع تصویر. اس متحرک تصویر میں مشتری پر گھڑیال موافق حرکت کرتے بادلوں کی پٹیاں دکھائی دے رہی ہیں: 720 پکسل، 1799 پکسل. مشتری کا عظیم سرخ دھبہ مختصر ہو رہا ہے (15 مئی 2014). گلیلین چاند. دائیں سے بائیں, ترتیب بلحاظ مشتری سے دوری: Io, Europa, Ganymede, Callisto. ↑ Anonymous (March 1983). "Probe Nephelometer". Galileo Messenger (NASA/JPL) (6). http://www2.jpl.nasa.gov/galileo/messenger/oldmess/2Probe.html۔ اخذ کردہ بتاریخ February 12, 2007. ↑ Rafe De Crespigny۔ "Emperor Huan and Emperor Ling" (پی‌ڈی‌ایف)۔ Asian studies, Online Publications۔ مورخہ ستمبر 7, 2006 کو اصل (پی‌ڈی‌ایف) سے آرکائیو شدہ۔ اخذ شدہ بتاریخ مئی 1, 2012۔ Xu Huang apparently complained that the astronomy office had failed to give them proper emphasis to the eclipse and to other portents, including the movement of the planet Jupiter (taisui). At his instigation, Chen Shou/Yuan was summoned and questioned, and it was under this pressure that his advice implicated Liang Ji. ↑ Saumon, D.; Guillot, T. (2004). "Shock Compression of Deuterium and the Interiors of Jupiter and Saturn". The Astrophysical Journal 609 (2): 1170–1180. doi:10.1086/421257. Bibcode: 2004ApJ...609.1170S. ↑ Kim, S. J.; Caldwell, J.; Rivolo, A. R.; Wagner, R. (1985). "Infrared Polar Brightening on Jupiter III. Spectrometry from the Voyager 1 IRIS Experiment". Icarus 64 (2): 233–48. doi:10.1016/0019-1035(85)90201-5. Bibcode: 1985Icar...64..233K. ↑ Niemann, H. B.; Atreya, S. K.; Carignan, G. R.; Donahue, T. M.; Haberman, J. A.; Harpold, D. N.; Hartle, R. E.; Hunten, D. M.; Kasprzak, W. T.; Mahaffy, P. R.; Owen, T. C.; Spencer, N. W.; Way, S. H. (1996). "The Galileo Probe Mass Spectrometer: Composition of Jupiter's Atmosphere". Science 272 (5263): 846–849. doi:10.1126/science.272.5263.846. PMID 8629016. Bibcode: 1996Sci...272..846N. ↑ von Zahn، U.; Hunten، D. M.; Lehmacher، G. (1998). 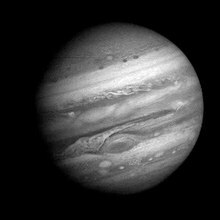 "Helium in Jupiter's atmosphere: Results from the Galileo probe Helium Interferometer Experiment". Journal of Geophysical Research 103 (E10): 22815–22829. doi:10.1029/98JE00695. ^ ا ب Seager، S.; Kuchner, M.; Hier-Majumder, C. A.; Militzer, B. (2007). "Mass-Radius Relationships for Solid Exoplanets". The Astrophysical Journal 669 (2): 1279–1297. doi:10.1086/521346. Bibcode: 2007ApJ...669.1279S. ↑ Guillot، Tristan (1999). "Interiors of Giant Planets Inside and Outside the Solar System". Science 286 (5437): 72–77. doi:10.1126/science.286.5437.72. PMID 10506563. Bibcode: 1999Sci...286...72G. http://www.sciencemag.org/cgi/content/full/286/5437/72۔ اخذ کردہ بتاریخ August 28, 2007. ↑ Burrows, A.; Hubbard, W. B.; Saumon, D.; Lunine, J. I. (1993). "An expanded set of brown dwarf and very low mass star models". Astrophysical Journal 406 (1): 158–71. doi:10.1086/172427. Bibcode: 1993ApJ...406..158B. ↑ Guillot, T.; Gautier, D.; Hubbard, W. B. (1997). "New Constraints on the Composition of Jupiter from Galileo Measurements and Interior Models". Icarus 130 (2): 534–539. doi:10.1006/icar.1997.5812. Bibcode: 1997astro.ph..7210G. ↑ Seiff، A.; Kirk, D.B. ; Knight, T.C.D. et al. (1998). "Thermal structure of Jupiter's atmosphere near the edge of a 5-μm hot spot in the north equatorial belt". Journal of Geophysical Research 103 (E10): 22857–22889. doi:10.1029/98JE01766. Bibcode: 1998JGR...10322857S. ↑ Showalter، M.A. ; Burns, J.A. ; Cuzzi, J. N.; Pollack, J. B. (1987). 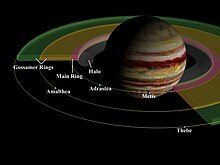 "Jupiter's ring system: New results on structure and particle properties". Icarus 69 (3): 458–98. doi:10.1016/0019-1035(87)90018-2. Bibcode: 1987Icar...69..458S. ↑ Burns، J. A.; Showalter, M.R. ; Hamilton, D.P. ; et al. (1999). "The Formation of Jupiter's Faint Rings". Science 284 (5417): 1146–50. doi:10.1126/science.284.5417.1146. PMID 10325220. Bibcode: 1999Sci...284.1146B. ↑ Herbst, T. M.; Rix, H.-W.۔ Guenther, Eike; Stecklum, Bringfried; Klose, Sylvio, ویکی نویس.۔ Star Formation and Extrasolar Planet Studies with Near-Infrared Interferometry on the LBT۔ San Francisco, Calif.: Astronomical Society of the Pacific۔ صفحات 341–350۔ Bibcode:1999ASPC..188..341H۔ آئی ایس بی این 1-58381-014-5۔ CS1 maint: Multiple names: authors list (link) – See section 3.4. ↑ Michtchenko، T. A.; Ferraz-Mello, S. (February 2001). "Modeling the 5 : 2 Mean-Motion Resonance in the Jupiter–Saturn Planetary System". Icarus 149 (2): 77–115. doi:10.1006/icar.2000.6539. Bibcode: 2001Icar..149..357M. ↑ Xi، Z. Z. (1981). "The Discovery of Jupiter's Satellite Made by Gan-De 2000 Years Before Galileo". Acta Astrophysica Sinica 1 (2): 87. Bibcode: 1981AcApS...1...87X. ↑ Dunham Jr.، Theodore (1933). "Note on the Spectra of Jupiter and Saturn". Publications of the Astronomical Society of the Pacific 45: 42–44. doi:10.1086/124297. Bibcode: 1933PASP...45...42D. ↑ Youssef, A.; Marcus, P. S. (2003). "The dynamics of jovian white ovals from formation to merger". Icarus 162 (1): 74–93. doi:10.1016/S0019-1035(02)00060-X. Bibcode: 2003Icar..162...74Y. ↑ NASA – Pioneer 10 Mission Profile. NASA. Retrieved on December 22, 2011. ↑ Hansen, C. J.; Bolton, S. J.; Matson, D. L.; Spilker, L. J.; Lebreton, J.-P. (2004). "The Cassini–Huygens flyby of Jupiter". Icarus 172 (1): 1–8. doi:10.1016/j.icarus.2004.06.018. Bibcode: 2004Icar..172....1H. ↑ Musotto, S.; Varadi, F.; Moore, W. B.; Schubert, G. (2002). "Numerical simulations of the orbits of the Galilean satellites". Icarus 159 (2): 500–504. doi:10.1006/icar.2002.6939. Bibcode: 2002Icar..159..500M. http://cat.inist.fr/?aModele=afficheN&cpsidt=13969974. ↑ Nesvorný, D.; Alvarellos, J. L. A.; Dones, L.; Levison, H. F. (2003). "Orbital and Collisional Evolution of the Irregular Satellites". The Astronomical Journal 126 (1): 398–429. doi:10.1086/375461. Bibcode: 2003AJ....126..398N. ↑ Horner, J.; Jones, B. W. (2008). 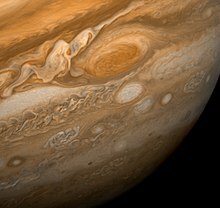 "Jupiter – friend or foe? I: the asteroids". International Journal of Astrobiology 7 (3–4): 251–261. doi:10.1017/S1473550408004187. Bibcode: 2008IJAsB...7..251H. ↑ Sagan, C.; Salpeter, E. E. (1976). "Particles, environments, and possible ecologies in the Jovian atmosphere". The Astrophysical Journal Supplement Series 32: 633–637. doi:10.1086/190414. Bibcode: 1976ApJS...32..737S. Tony Dunn۔ "The Jovian System"۔ Gravity Simulator۔ اخذ شدہ بتاریخ مارچ 9, 2007۔ —A simulation of the 62 Jovian moons.